Regular readers of my blog will know that I have had a pretty-much-constant battle with my weight since the birth of the boy. (Just search fitness, weight-loss or baby-weight on this site to see how much.) Prior to being pregnant that first time I had been somewhat of a skinny-minnie most of my life. Which I liked. Post pregnancy I have struggled to get anywhere close. Following a c-section I found it enormously difficult to recover both physically and mentally. Exercising was pretty much entirely out of the equation for a good six months and, even then, I struggled. I honestly thought that I would never regain my pre-baby figure and over time I came to terms with that. 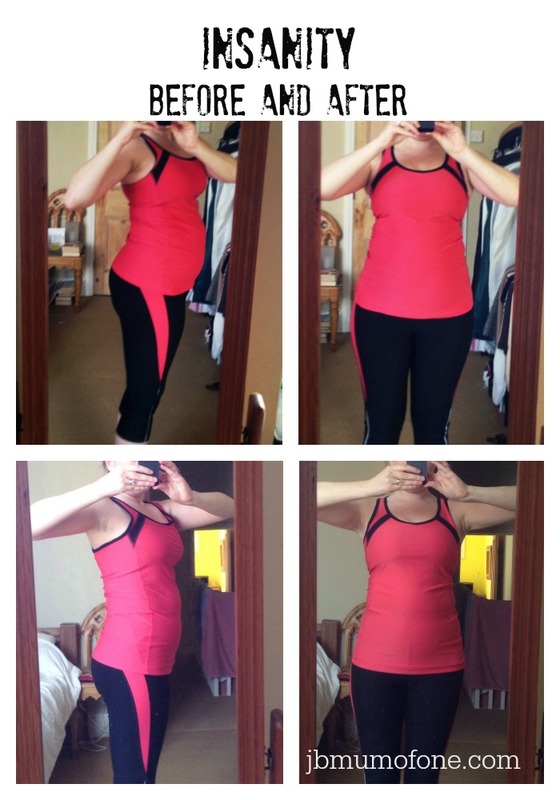 Little Miss was delivered naturally and, having put on a huge amount of chocolate-scoffing cheese-inhaling crisp-consuming pregnancy weight I was keen to try and lose weight again and this time the recovery was so much faster. I began exercising gently after three weeks and six weeks post birth I was re-doing the 30 day shred…very slowly…every three or four days. 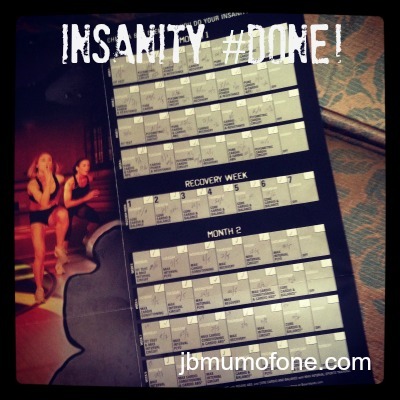 Mr B was keen to improve his own fitness and was fascinated by the adverts we had seen for Insanity from Team Beachbody. Having spoken to several friends who had tried it themselves I convinced him it might just be worth the £100 price tag. He wasn’t convinced. So I bought it for his birthday. We started doing Insanity together at the end of last year. Both working and with two small kids we couldn’t follow the timetable but most weeks we would accomplish three workouts. Except when we were on holiday and lost two weeks. And when I had flu and lost five weeks. And then another holiday…you get my drift. Mr B won’t let me show you his but if you take a browse through my Instagram feed you can check out the six pack! Insanity is hard work. It is sometimes mind-numbingly repetitive. It will, at times, bore you to death…but it does work. Even in the half-hearted way we did it. I am almost back to where I want to be but still have about half a stone, and developing that elusive six-pack, to go. I am totally convinced by Shaun T’s methods and have just ordered Focus T25 to start next week. Some post-work nights the hour long Insanity sessions were hard to fit in and I am hoping 25minutes will fit in much better with our family life. So, how will we get on? I’ll keep you posted. I do know that the support of Mr B and my fellow Team Beach Body Worldwide Facebook friends will keep me going. You guys are awesome. And in the words of the great man himself, when you’re not sure you can face exercising…JUST PRESS PLAY. You will always manage way more than you expected. Honestly I think you looked amazing in the before pictures but very well done. I am terrible for staying motivated I really am. Me too normally Joy. Having Mr B do it with me made a huge difference as we were able to encourage each other. You’ve made amaizing progress. Keep up the good work. Thanks Seth. More to do but am on my way. It was pretty daunting at the start. I couldn’t even finish the warm up LOL but you see an improvement in your fitness so quickly it doesn’t take long to get into it. Looking good – well done! Thanks Laura. Am not quite where I want to be but feel like the end is in sight now, fingers crossed. I’m so pleased you actually blogged this!!! You look awesome! I really need to start doing stuff properly and get on it, I’m jealous of your flat belly!! So impressed… I’ve got to a certain age where eating the amount of cake and chocolate I do, is just not do-able so I too am stepping up the exercise – not heard of this so will check it out! Wow – what a difference. Go you! Well done you, I so need to get fitter. Will take a look at this.